Overlooking the mighty Firth of Forth Estuary, Scotland’s premier city enjoys a commanding location on Scotland’s east coast and boasts a unique atmosphere with its medieval connection and romantic setting. 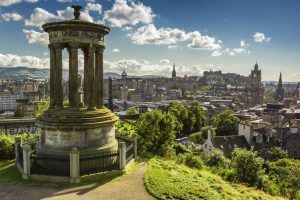 The castle sets the scene and a host of other quality sights, together with plentiful shopping, nightlife and the famous annual Edinburgh Festival making the capital city one of the finest weekend destinations in Europe. The first thing you will be pointing your camera at will undoubtedly be the Edinburgh Castle, which stands proud in the center of the city on a rocky outcrop; views of the city from the 1,200-year-old castle are a sight to behold. Nearby the castle is the Cowsgate area, which is a great place to lose yourself among the plethora of alleyways. From the castle, the shop-lined Royal Mile where there is plenty of opportunity to snap a busking piper or go shopping for some traditional tartan and souvenirs, stretches to the Palace of Holyrood. If you fancy more lofty views and are feeling energetic, another top Edinburgh attraction is Arthur’s Seat, not far from the castle. The center of Edinburgh is one of impressive neo-classical buildings and superb museums such as the National Gallery of Scotland and the excellent and free Museum of Scotland, while the Scottish Parliament is also worth a shot or two. You will hardly be pushed to find a place to sample a wee dram of whisky as Edinburgh is simply loaded with choices. Many of Scotland’s best watering holes are in Edinburgh and there are some great traditional pubs as well as numerous modern bars and clubs. Areas to take note of are the Westend, Grassmarket and Rose Street, which goes particularly lively at weekends and offer plenty of excitement and the latest banging tunes into the late hours. However, for a traditional atmosphere and good choice of ales, head for the Bow Bar on West Bow.